A harp is a musical instrument consisting of a triangular frame open on both sides which contains a series of strings of varying lengths that are played by plucking. The length of the string determines how high or low a sound it makes. A modern concert harp stands about 70-75 in (1.8-1.9 m) high, is about 40 in (1 m) wide, weighs about 70-90 lb (32-41 kg), and has 47 strings, ranging in size from a few inches to several feet in length. Smaller instruments similar to the harp include the lyre, which has strings of the same length but of varying thickness and tension; the psaltery, which has a frame open only on one side; and the dulcimer, which is similar to the psaltery but which is played by striking the strings with a hammer rather than plucking them. The earliest harps probably developed from hunting bows and consisted of a few strings attached to the ends of a curved wooden body. A harp used in Egypt about five thousand years ago consisted of six strings attached to this kind of body with small wooden pegs. By 2500 B.C. , the Greeks used large harps, consisting of strings attached to two straight pieces of wood which met at an angle. By the ninth century, frame harps, which enclosed wire strings within a triangular wooden frame, appeared in Europe. They were fairly small [2-4 ft (0.6-1.2 meters) high] and were used by traveling musicians, particularly in Celtic societies. Many performers of traditional music (who are usually known as harpers rather than harpists) still use this type of instrument today. The inability of these harps to play accidentals (notes a half-tone higher or lower than the notes of the scale to which the strings were tuned) led to a number of experiments. Harps were built with extra strings to play accidentals, either by increasing the number of strings in a single row or by adding a second row of strings parallel to the first to form double strung harps. In Wales, some harps had three rows of strings. Instead of increasing the number of strings, some harpmakers devised mechanisms for changing the length of the strings, thereby adjusting the pitch. By the end of the seventeenth century, hooks were used in the Tyrol region of Austria to shorten strings as needed, providing two notes from each string. In 1720, Celestin Hochbrucker added seven pedals to control these hooks. In 1750, Georges Cousineau replaced the hooks with pairs of metal plates and doubled the number of pedals to produce three notes per string. In 1792, Sébastien Érard replaced the metal plates with rotating brass disks bearing two studs, each of which gripped the string like a fork when the disk turned. He also reduced the number of pedals back to seven by devising pedals which could occupy three different positions each. Érard's design is still used in modern concert harps today. In the late nineteenth century and throughout the twentieth century, innovations were made in harpmaking by the American harp manufacturing company Lyon and Healy. These innovations included redesigning the stave back and the sound chamber of the harp. A harp is basically a large wooden triangle, usually made primarily of maple. The front, vertical side of the triangle is known as the column or the forepillar. The upper, curved side of the triangle is known as the neck. The third side of the triangle is known as the body. White maple is the best wood for these three sides because it is strong enough to withstand the stress of the strings. The soundboard, which is contained within the body and which amplifies the sound of the strings, is usually made of spruce. Spruce is used because it is light, strong, pliable, and evenly-grained, enabling it to respond uniformly to the vibrations of the strings to produce a rich, clear sound. The middle of the soundboard, known as the centerstrip, is attached to the base of the strings and is usually made of beech. Beech is used because it is tough enough to bear the tension of the strings. 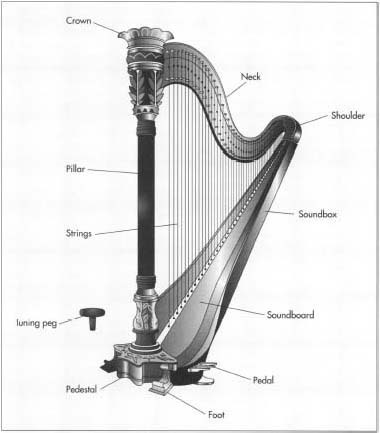 The curved plate on the neck of the harp, to which the strings are attached, is made of brass. The disks which control the length of the strings are also brass, as are the pedals which control the disks. These external metal parts are often plated with gold for appearance and to resist tarnishing. The complex internal mechanism which connects the pedals to the disks, known as the action, is made of brass and stainless steel, with some parts such as washers made of a hard plastic such as nylon. The strings of a harp are made of a variety of materials, including steel, gut (derived from the intestines of sheep), and nylon. Each material has different properties which make it suitable for a particular length of string. The surface of a harp may be treated with clear lacquers or wood stains of various colors such as ebony or mahogany. It may also be inlaid with decorative woods such as walnut or avodire (a pale yellow West African wood). Some harps are gilded with 23 karat gold leaf. The soundboard may be decorated with paint or gold decals. Each harp is a unique work of art. The design of the harp depends on the needs of the performer. Traditional harpers require small, light instruments with strings controlled by levers. Classical harpists require much larger instruments with strings controlled by pedals. The exterior design of harps varies from simple curves with natural finishes to intricate carvings with a wide variety of decorations ranging from abstract geometric designs to romantic floral displays. 1 Boards of spruce, maple, beech, and other woods are received by the harpmaker and inspected. In order to perfectly match the grain of harp with a natural finish, boards of wood all from the same tree may be received together. The boards are then stored for about six months to become adjusted to the local climate in order to avoid any future problems with splitting or cracking. 2 Power woodcutting machines cut the boards into rough approximations of the pieces needed. More detailed shaping of these pieces is done with hand held woodcutting tools. Harpmakers learn their craft in a series of apprenticeships. New workers build the base of the harp, then go on to learn the skills needed to build the body and the soundboard. Only the most experienced harpmakers work on the column and the neck. Many thin layers of wood are glued together under pressure to foim wooden parts which are stronger than solid wood. The various wooden parts are then stored to await assembly. 3 Metalworkers use a wide variety of power and hand held tools to shape brass and steel into the nearly 1,500 pieces needed to make up the action of the harp. Some simple parts may be purchased from outside manufacturers. The metal components are then stored to await assembly. A modern concert harp stands about 70-75 in (1.8-1.9 m) high, is about 40 in (1 m) wide, weighs about 70-90 lb (32-41 kg), and has 47 strings, ranging in size from a few inches to several feet in length. may be hand carved with complex designs which take several weeks to complete. All wooden parts are sanded smooth in preparation for finishing. They are then sprayed with clear lacquer or colored wood stain. After one coat of lacquer or stain is applied, it is allowed to dry and then sanded smooth again. This process is repeated up to 10 times over as long as two weeks. The soundboard may then be painted with elaborate designs. 5 Some harps have gilded columns and bases. The gilder begins by sanding unfinished wooden parts to remove all imperfections. Layers of gesso (a special mixture of glues) are applied to the smooth wood. After the gesso sets, layers of clay are applied and sanded smooth. Glue is applied to a small area of the smooth clay. Gold leaf 0.000004 inches thick (0.1 microns) is applied with a brush. (The gold is so thin that it cannot be handled directly by human hands.) The process is repeated on other small areas until an entire component is gilded. Excess gold is wiped away and another layer of gold leaf is applied. Some portions of the gold are burnished to a brilliant sheen by rubbing them with a tool made of polished agate. Clear lacquer is applied to protect the gold. 6 Master harpmakers begin the slow, painstaking process of bringing the wood and metal components together to form the harp. The parts of the neck, body, soundboard, base, and column are brought together to form the frame. The complex mechanism of the action is fitted within the column and connected to the disks on the brass plate below the neck and the pedals on the base. Strings are attached to brass pegs on the neck, fed through the disks, and attached to the centerstrip of the soundboard. At first the strings are very loose. They are slowly tightened to the correct level of tension and tuned to the correct pitch. 7 After a final inspection, the harp is packed in close-fitting foam within a cardboard box to be shipped to the purchaser. The harp manufacturer also makes special protective wooden cases with wheels which allow the harp to be moved with relative ease. Every step in the harpmaking process requires extreme attention to quality. Lumber is inspected for flaws. In particular, the spruce used for the soundboard is tested for its acoustic properties to ensure the quality of the sound it will produce. Each wooden component is individually inspected by a master harpmaker, then again after it has been sanded smooth for finishing. Metal components are also individually inspected. Those purchased from outside companies are inspected to ensure that they match the blueprints supplied by the harpmaker. The strings are carefully tuned during the assembly process by an expert tuner. The action is tested to ensure that it is silent to avoid interfering with the music. The approximately 400 holes in the brass plate which holds the disks may be drilled by computer-controlled equipment to ensure accurate alignment. The harpmaker may choose to have a professional musician test each completed harp to ensure the quality of its sound. Two seemingly contradictory trends hint at the future of the harp industry. Sparked by an increasing interest in Celtic music, more musicians are using harps similar to those used 1,000 years ago. On the other hand, many rock and jazz musicians are tuming to electric harps, which produce amplified sounds in a manner similar to electric guitars. Despite these trends, it seems likely that harps similar to those designed by Sebastien trard will continue to dominate the industry. Gammond, Peter. Musical Instruments in Color. Macmillan, 1976. Rensch, Rosalyn. Harps and Harpists. Indiana University Press, 1989. Lyon and Healy. http://www.lyonhealy.com (July 9, 1997). Strohmer, Shaun. "What Makes a Harp a Harp." http://harp.column.com/feature.html (September 25, 1996). "The length of the string determines how high or low a sound it makes." -- Well, partially. There are two ther factors: the tension on the string (that which is adjusted by tuning) and the weight per unit length of the string.